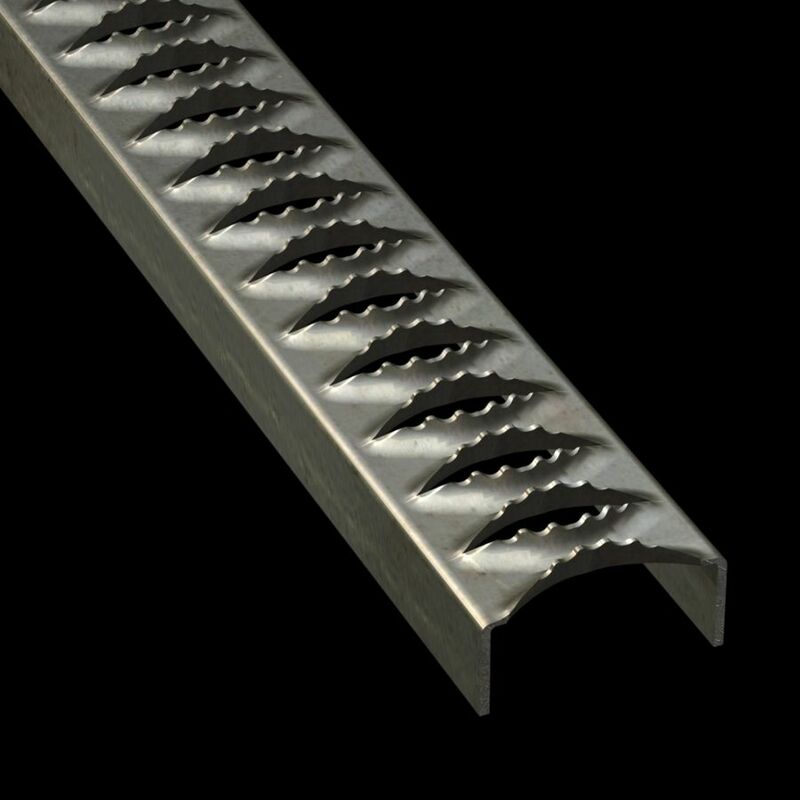 McNICHOLS® Plank Grating, Ladder Rung Plank, GRIP STRUT®, Carbon Steel, Hot Rolled Pickled and Oiled, Mill Finish, 12 Gauge (.1046" Thick), 1-Diamond (2-1/2" Width), 1-1/8" Channel Depth, Serrated Surface, Long Way of Opening (LWO) Parallel to Width of Ladder Rung Plank, 34% Open Area, 2.5000" x 120.0000"
ITEM 2601101210 - 2-1/2" x 120"
Sizes (Width x Length) 2-1/2" x 120" 2-1/2" x 120"
McNICHOLS carries slip-resistant Ladder Rung Plank in GRIP STRUT® and TRACTION TREAD® styles, as well as GRIP TIGHT® Ladder Rung Covers. We also stock an Extruded Ladder Rung Plank option with the DIAMONDBACK® tradename. This line of Hole Products requires minimal maintenance and ensures solid footing for years. Ladder Rungs come in several primary material types and can be cut-to-length. Product applications/uses include Rungs for rooftop access ladders, truck or emergency vehicle steps, covers over existing solid Ladder Rungs and more. Please consider loading, span, support and attachment needs for your project. We invite you to browse Ladder Rung applications in our Gallery. Choose from our broad selection of Ladder Rung Plank, Extruded Ladder Rung Plank or Ladder Rung Cover Plank construction types for your project. Determine the series type and name (GRIP STRUT® Ladder Rung Plank, GRIP TIGHT® Ladder Rung Cover Plank, etc.) of the Ladder Rung product for your project. Select the primary material type including Aluminum, Carbon Steel, Galvanized Steel, or Stainless Steel. Inventory is typically "mill finish" unless otherwise specified. We provide more information on Primary Material Types and Product Finishes in the links provided in the Overview section on the Ladder Rung Resources landing page. Decide what material gauge number or thickness in inches is right for your project. Extruded products do not have an actual gauge due to the manufacturing process. These items are specified as an Extrusion. Choose the surface profile for your application. A surface profile includes the number of openings to width, type of opening and the width, measured in inches, of the Ladder Rung Plank or Ladder Rung Cover Plank (e.g. 4-Row (2-1/4" Width), etc.). Select the corresponding channel depth for your surface profile selection. Choose the percentage of open area desired in the Ladder Rung construction type chosen. Identify the number of Ladder Rungs needed as well as specific cut sizes (lengths). Specify any requirements like non-standard tolerances, etc. View McNICHOLS® Ladder Rung Resources on tolerances, finishes, available sizes, and more! Helpful McNICHOLS® Ladder Rung load tables to save, print, or share! Sizes (Width x Length) 2-1/2" x 120"